We've got some gorgeous new products hitting the stores today and I wanted to give you a look at some of the fun I've been having with them. As well as give you a heads up on some *Limited Quantity* Bundle deals available right now at wplus9.com! 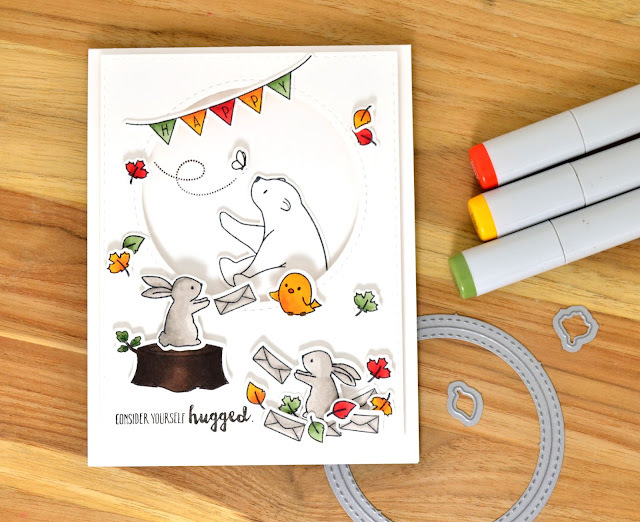 I am very excited to unveil a couple of collaboration sets we've been working on with Stephanie Low Creative. Stephanie is an amazing artist and her work fits in so well here at Wplus9! The Butterfly Mandala is a perfect example of her divine illustration skills. There is a large mandala design featuring leaves and butterflies included in the set, along with individual stamps of each of the elements that make up the mandala. One of my favorite techniques to use with the mandala is emboss resist. 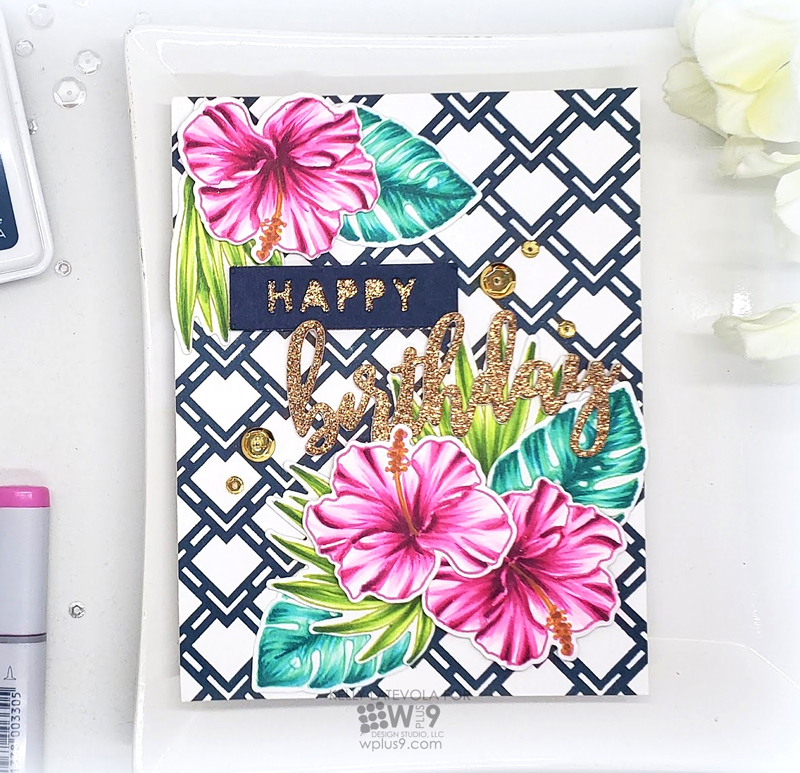 I stamped the mandala pattern all over a panel of Tim Holtz Watercolor Cardstock in Versamark Ink and then heat embossed using WOW! 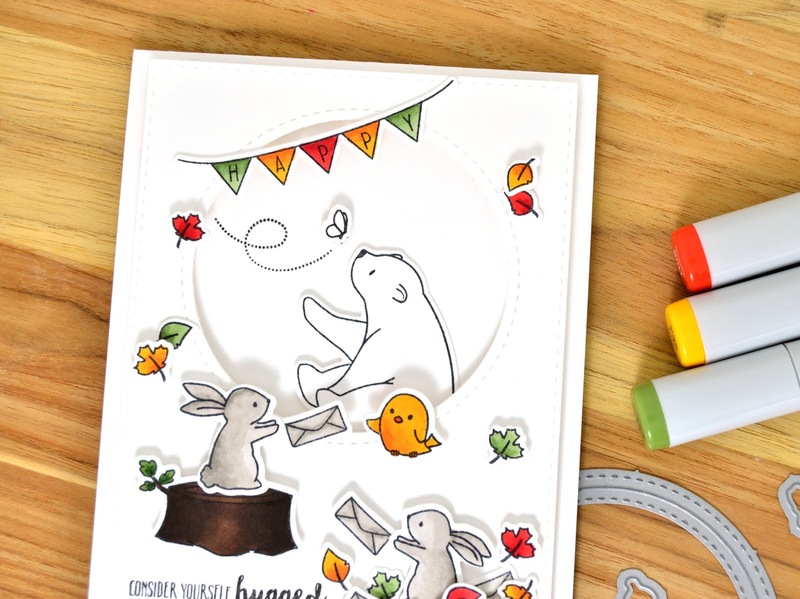 Super Fine Bright White embossing powder. I blended Distress Oxide Inks over the entire background in Abandoned Coral, Spiced Marmalade and Candied Apple. I splashed a little water onto the background for a mottled effect. That gorgeous sentiment is also included in the set. 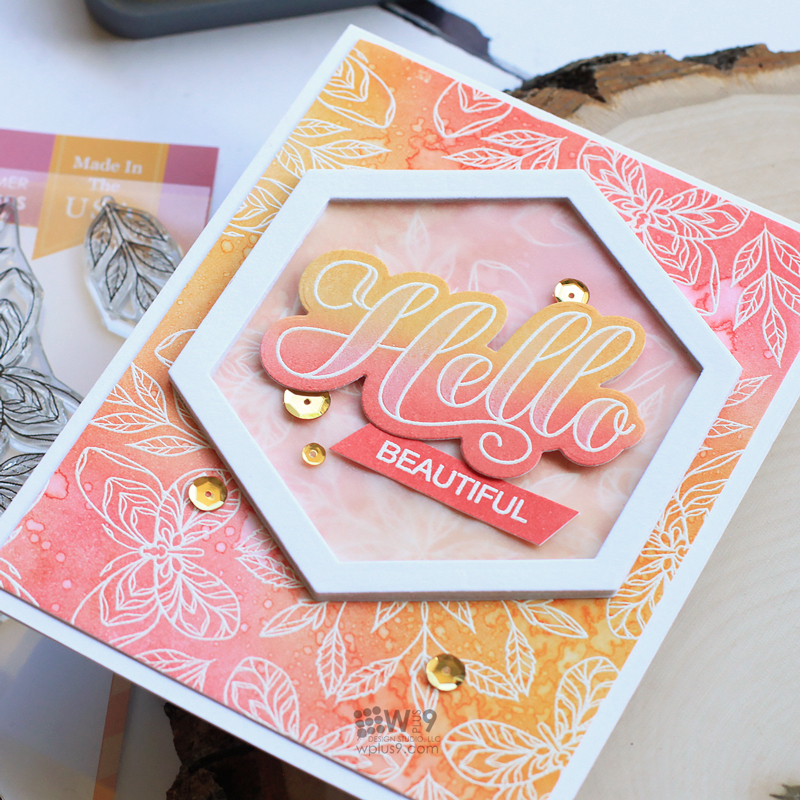 I used the same technique and colors for the large "Hello" and then die cut it using the companion die.I then stamped the "fill" image included in the set using White PURE COLOR pigment ink. 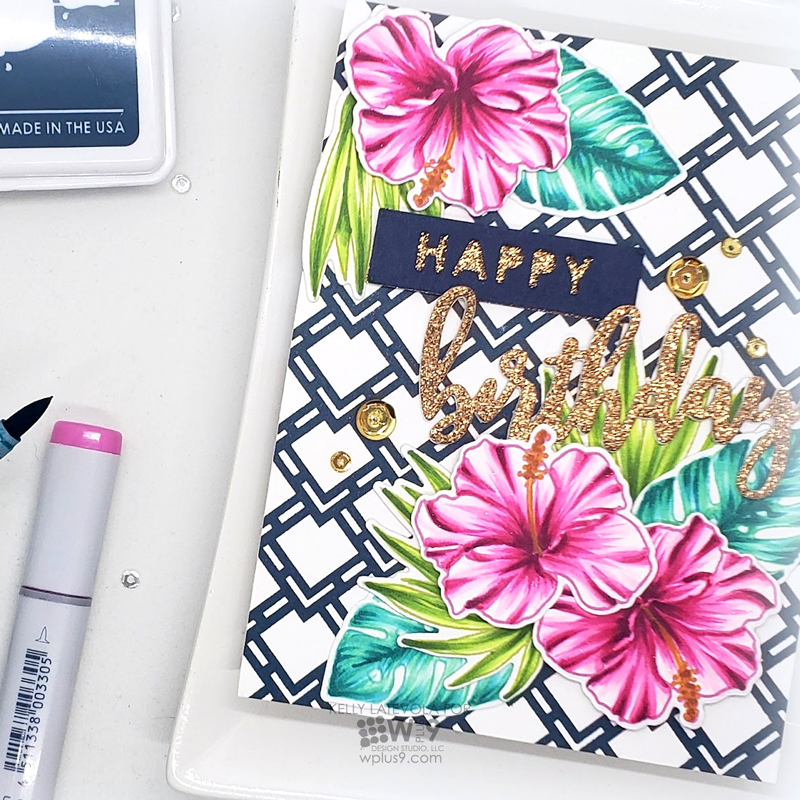 This image fills in the open areas of the "Hello" - perfect for a two-toned sentiment. 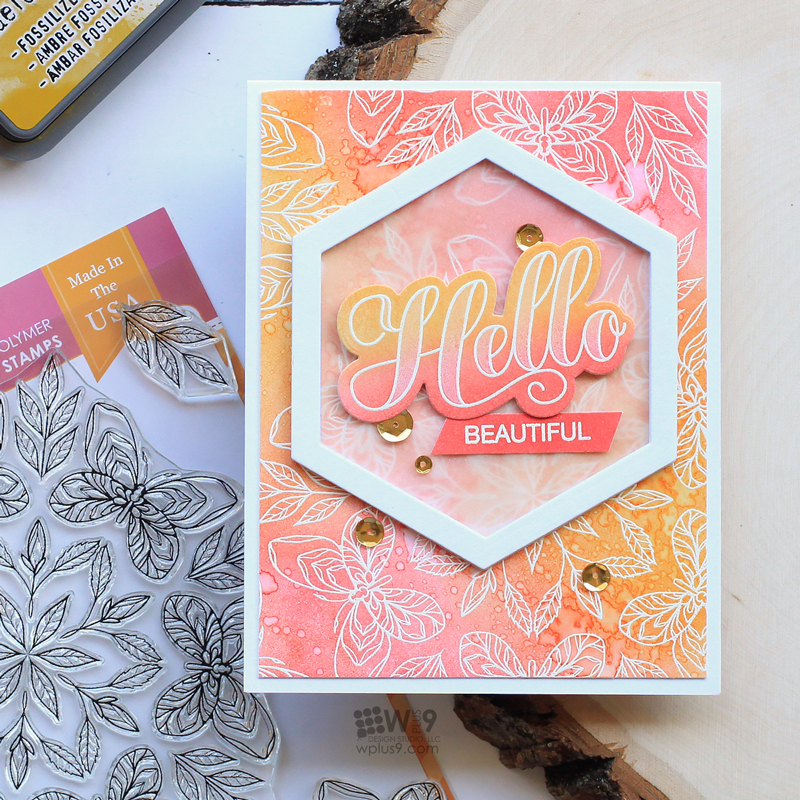 To anchor and mat the sentiment, I used the new Clear Cut Stackers: Hexagon Die. In fact, I used that die A LOT this release! 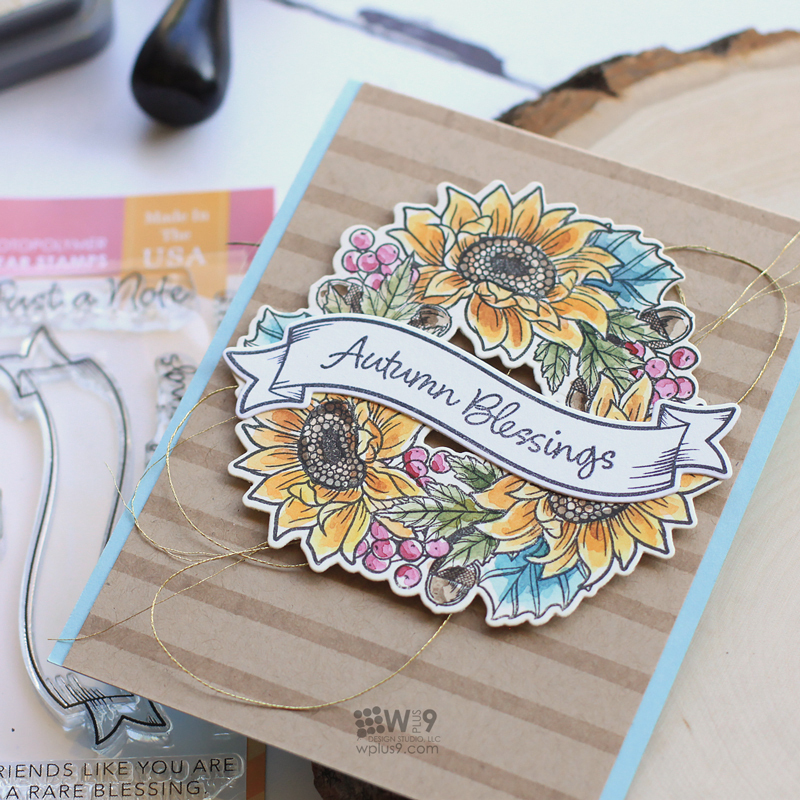 Another must have Wplus9 x Stephanie Low Creative set is the new Autumn Blessings stamps and die. This set is packed with images! 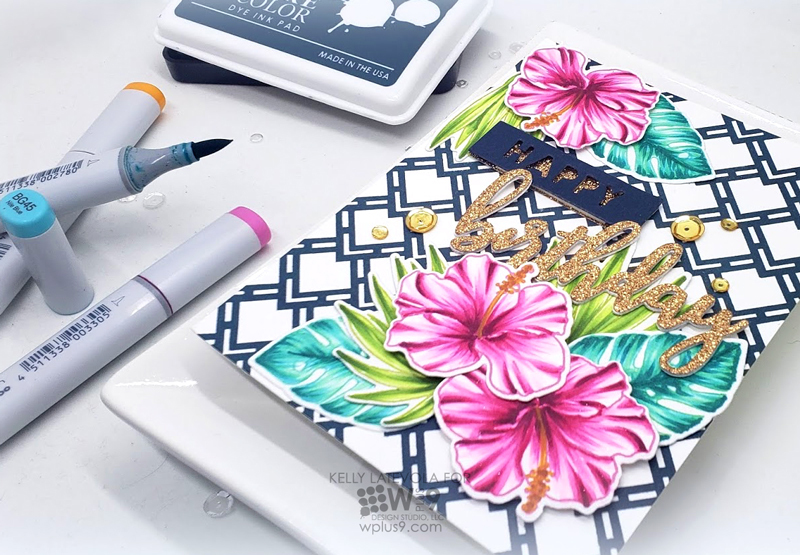 It features the large wreath, all of the individual elements that make up the wreath so that you can create your own floral arrangements, and several sentiments that fit inside the banner and frame also included in the set. Wow! I went with a simple watercolored wreath for this one. I stamped the image onto watercolor paper using Wplus9 PURE COLOR Dye Ink in black and then did some very simple and loose watercoloring using Daniel Smith watercolors. Any watercolors would do here, but I had a few of the Daniel Smith Palettes from Simon Says Stamp right at hand, so that's what I went with. I stamped the banner and sentiment, then die cut everything using the companion die. I stamped a Kraft card panel using the stripe from our Borders & Backgrounds 2 stamp set in Versamark Ink and adhere to an aqua card base. I then layered my wreath and banner on top, securing in place with foam tape. Aren't these amazing? And you know what makes them even more amazing? Right now, we have a limited quantity of Bundle Sets available for both of these. The Bundles are a 15% savings over purchasing separately! This is for direct orders only (wholesale excluded), and our way of saying "Thanks for supporting us!". The entire release really is gorgeous and I've had a lot of fun creating with it. Here is a quick overview of all of the new stuff now available. Hello! It's Kara and I have been sending out a bit of happy mail to some of my friends. I needed to create a few more 'just because' cards to replenish my stash. 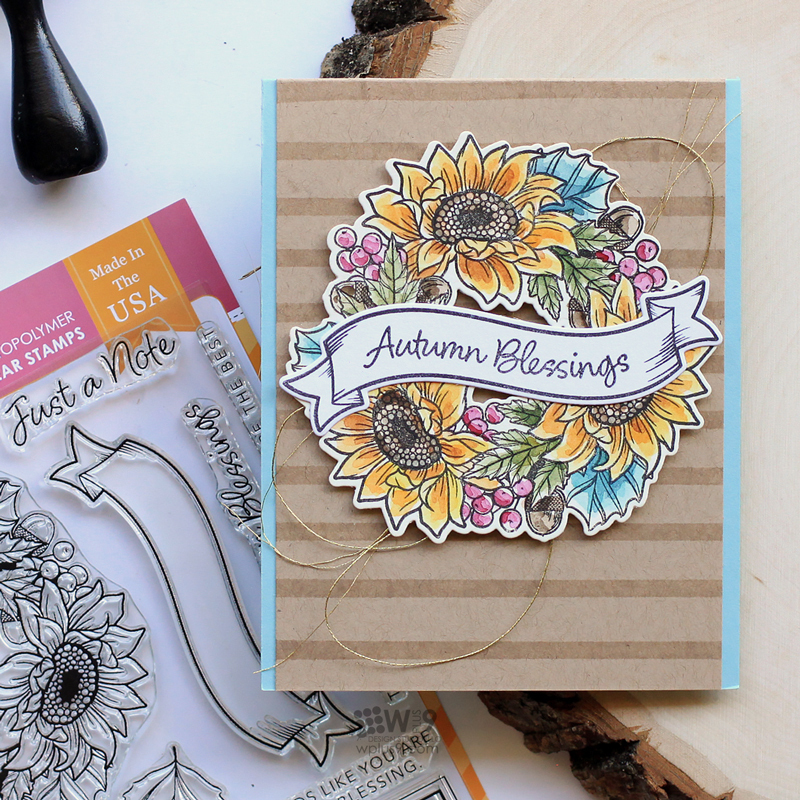 I pulled out Happy Mail and as well as Friends For All Seasons: Fall for some seasonal accents. Summer has been beautiful! While it is still warm here, I can definitely feel a shift happening as we move towards Autumn. 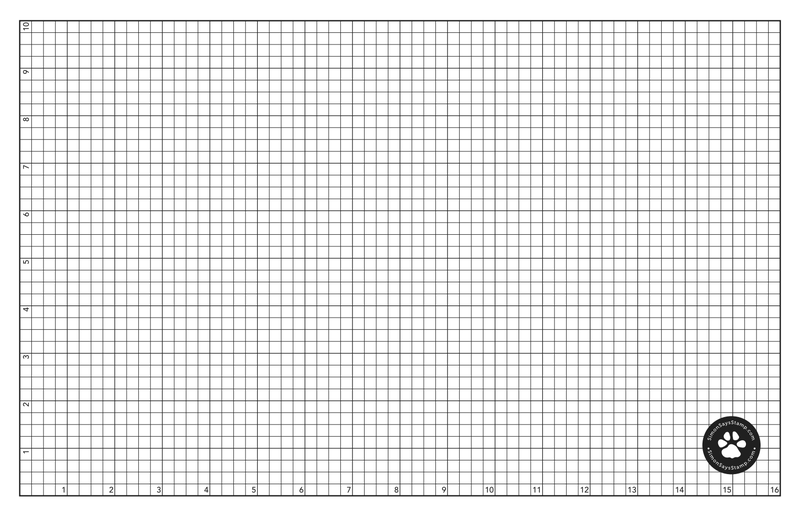 I know many people plan out their card designs before they begin. I am not one of them. I prefer to fly by the seat of my pants. 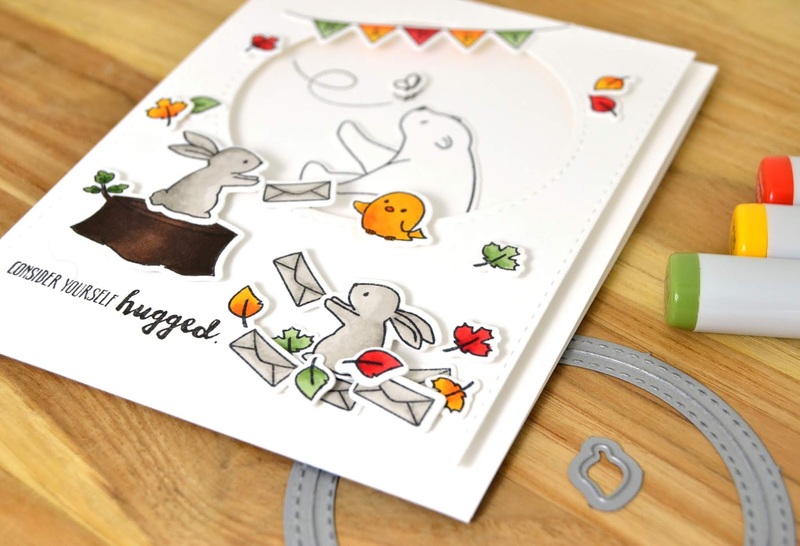 I start by stamping, die cutting and coloring some images that I may want to use. As I start moving the pieces around I'll come up with an idea for placement. After positioning all of the elements in the foreground scene I was really happy with how it looked. The bunny on the stump, the bunny in the pile of leaves and happy mail, but the upper portion looked empty. I decided to add additional images in the background. 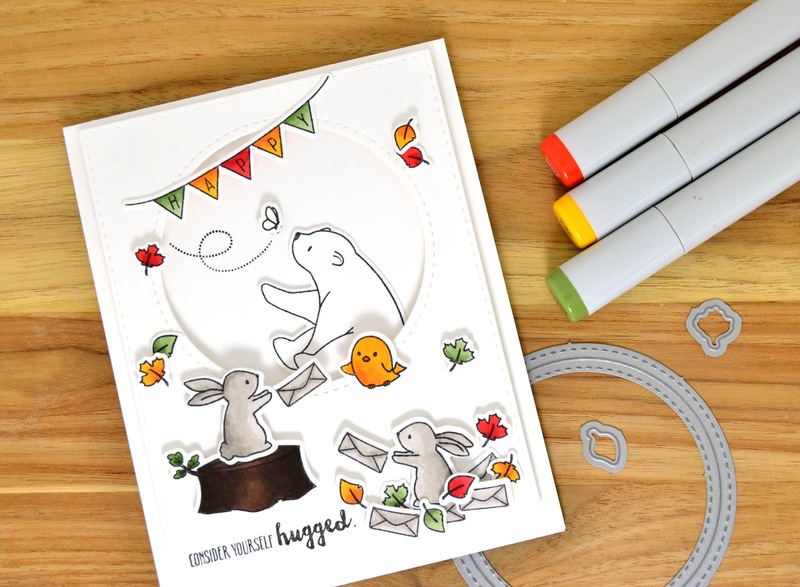 In order to make them not appear to be floating in the air I cut out the circle window and popped it up on the card front. This created depth so when I tucked in the bear and butterfly they felt like they were in the background and not floating in space. I also left them uncolored to emphasize the fact that they are in the background and not the main focus of the design. Thanks so much for stopping by today. Don't forget to send out some Happy Mail! Wow, It's been a while since I've shared over here. I've missed you guys! Full disclosure this card took forever to make. Not because of the technique, nope. Because I moved and then had to track down all the pieces and parts! Haha! 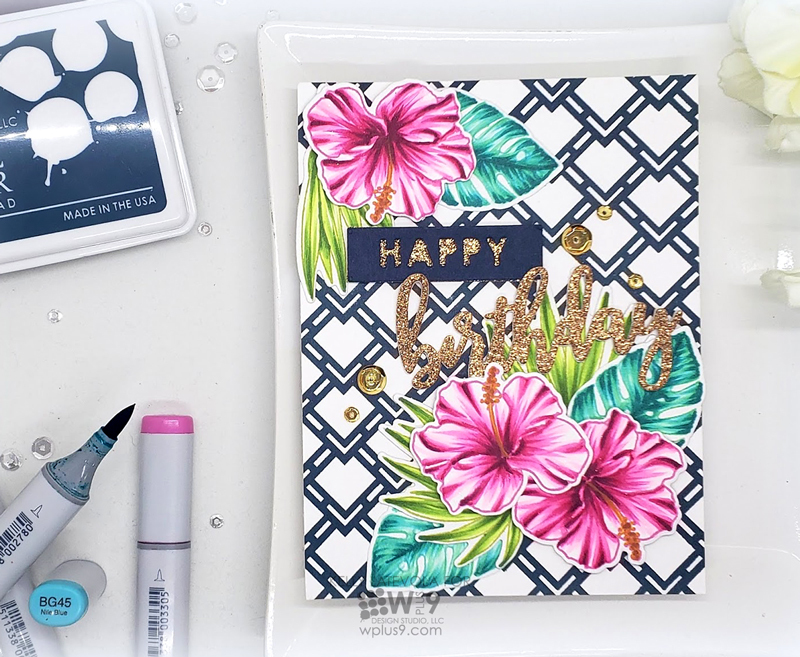 I started by stamping the gorgeous trellis background stamp in Nautical Navy and it was done. There's something really nice about not having to fuss with your background all the time. I really wanted to try my hand at no line coloring the beautiful hibiscus included in the Tropic Fever set. I chose a couple of different colors that would match the combination I had in mind and stamped them out. I did all the coloring using copic markers. Because WPlus9 inks are alcohol based they blend really nicely with alcohol markers of any kind. Once the coloring was done I die cut them and started on my sentiment. You can watch the entire card come together in the video below. It's definitely a little bit busier than my usual style, but I really love how it turned out. The gold with those gorgeous summer colors is making me super happy.